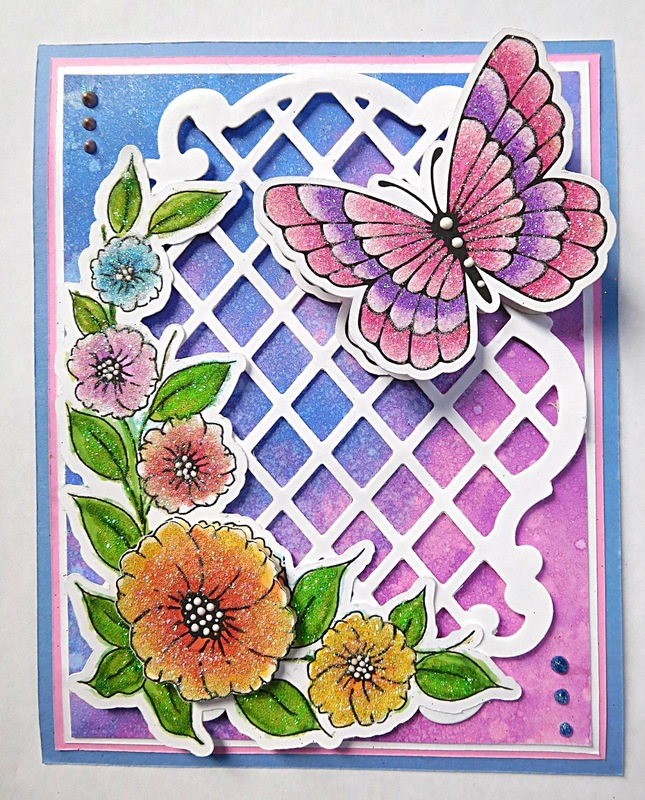 Good morning all it's Belinda here this morning to share a card that was made using only the digi stamp set from the Corner Garden. What a beautiful set, it is so pretty and can be used so many ways. Let's get started on this project. First all of the images were sized and cut out using my Silhouette with the color digi stamps. The larger flower was cut a second time and layered on top of the corner image. 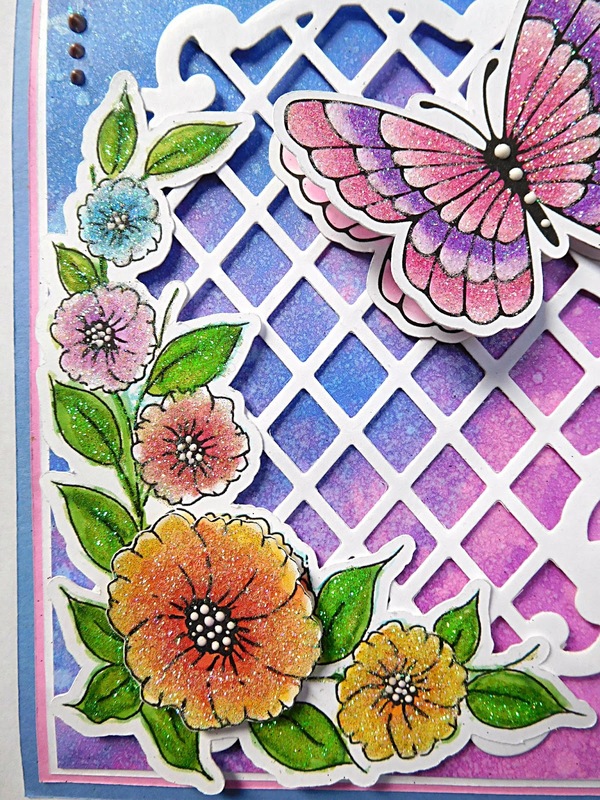 Sparkle was added to all of the flowers using the Small Nuvo Glue Pen, Spirited Green, Waterfall, Bubblegum and Sunny Daze glitter. The background paper was printed using the digi papers also included in this set. 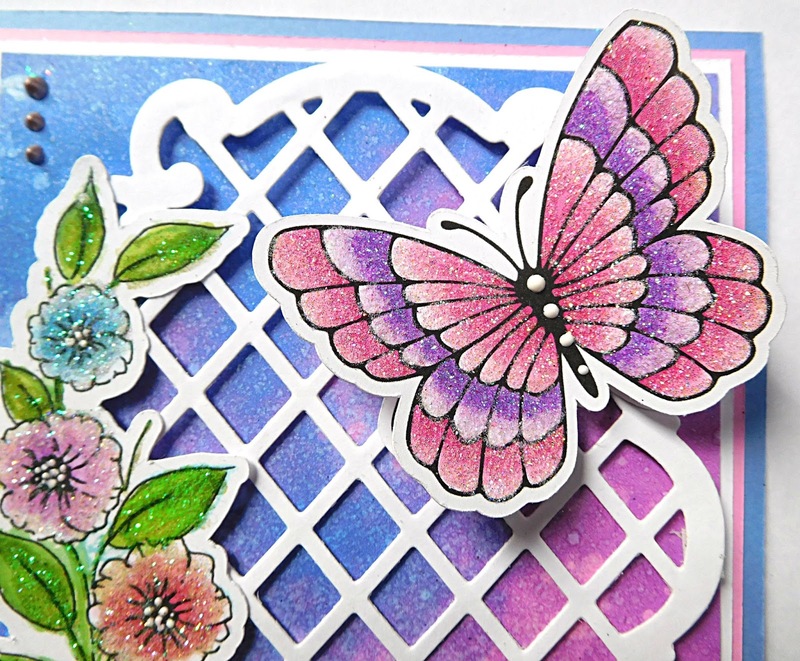 A light mist of Tattered Angels Pearl was used on the paper to give a soft shimmer. Next the lattice frame was die cut using a Anna Griffin die. The corner unit was placed on top of the frame and the frame was adhered to the background paper using foam dots. Small drops of Dazzling Blue Glitter Drops were placed in the corners. The butterfly was printed out twice and layered together using foam tape. For the sparkle the Small Nuvo Glue Pen was used along with Bubblegum, Lavender Iris, Orchid and Sparkle Snow glitters. Small drops of White Crystal Drops were added to the middle of the body. The digital papers in the set are just gorgeous!!! Thanks so much for stopping by have a wonderful day!! I Love the Lattice idea!!!! This card is amazing! This has me thinking of tons of cards! !